Barbra Streisand's infrequent tours have served as a kind of running retrospective of a still thriving career, but those who've seen the singer in the past saw a looser, more relaxed Streisand on the stage of San Jose's HP Pavilion Monday night - a woman more comfortable in her own skin and perhaps with her public persona as well. Backed by a 60-piece orchestra conducted by Bill Ross, Streisand took the near capacity audience on a tour of signature songs from her long career -- "Don't Rain on My Parade," "My Funny Valentine," "Somewhere," "On a Clear Day You Can See Forever," "Evergreen" and "People"-but the show was much more than just her greatest hits. The set list also included Irving Berlin's 1923 standard "What'll I do," "Lost Inside of You," one of the lesser known songs from "A Star Is Born," and Jimmy Webb's "Didn't We?" from her new album of career outtakes, "Release Me." In the second half of the show, she joked with guest trumpeter Chris Botti that while he does 250 tour dates a year, she's done 89 or 90 in the past 50 years. One reason is that in her 1967 free Central Park concert, she forgot the lyrics to one of her songs and was so unnerved by the experience, it took her 27 years to do another concert. Back then, she performed on a terraced stage constructed over the rocks in the park's Sheep's Meadow, holding forth despite a pre-concert death threat and a light rain mid-show. Monday night, the audience could buy $40 souvenir programs and Barbra tote bags at the Pavilion, while Streisand guarded against forgetting song lyrics with the use of a Teleprompter. Times have changed, and so have the ticket prices - big time. The only hint of her famously obsessive attention to detail came in an onstage chat with her son, Jason Gould, who made an offhand comment that the small vase of orange roses on the table next to her chair matched the color of the flowing cape and gown she wore to show off antique art deco jewelry. Well, not quite. The dress was coral, she noted, but the roses were orange. Gould, her son by her first husband Elliott Gould, was on hand to recreate the duet he'd performed with his mother at the recent opening of the new Barclay's Center in Brooklyn, "How Deep Is the Ocean." Before introducing him, she screened a film he'd made for her birthday, comprising family photos from his infancy on, augmented by his rendition of "Nature Boy." He displayed a warm, velvety tone and his mother's perfect diction and phrasing in his solo turn with the song, "This Masquerade," which, on the eve of the election, he dedicated to both major parties and ended with a slight lyric change, "all in this political masquerade." Streisand, an outspoken Democrat and Obama supporter, got through the entire night without mentioning the president's name once, but she did make her choice clear because, as she joked, "everyone's entitled to my opinion." Yes, the basic elements of the show were planned to a T, including costume changes and much of the patter. But there was a newfound sense of legitimate spontaneity at several points. As she introduced her half-sister, Roslyn Kind, to recreate the duet of "Get Happy" and "Happy Days Are Here Again" Streisand did with Judy Garland on the latter's TV show in 1963, the two chatted about their late mother who always wanted to be a singer and finally made it, posthumously, as her daughters played a recording of her singing. Granting an audience member's request to do "Stoney End," Streisand confessed she's never understood what the song was about. When another audience member asked what it's like to be a living legend, she didn't miss a beat before answering, "as long as it still has 'living' in front of it." She complained that she was wearing new heels and they were catching in her gown, plopped herself down on a step at the rear of the stage while Gould did his solo and, after fidgeting on her tall chair early in the concert, joked that it wasn't easy sitting on sequins. Her tribute to her late friend and conductor, Marvin Hamlisch, who'd been the rehearsal pianist for "Funny Girl," was touching and true, a medley of "The Way We Were," using Hamlisch's original arrangement of the song for the film, and his song "Through the Eyes of Love." The one over-the-top moment came with a high produced performance of Leonard Bernstein's "Make Our Garden Grow" from "Candide," which not only included all the evening's guest stars, but also the San Jose Symphonic Choir. It was an effective production number, but oddly not as powerful as when Streisand was singing by herself. Guests like Gould, Botti and the Italian teen boy trio Il Volo gave her a chance to change costumes through the night and share some of the burden of filling the show's three hours. She joked that the ages of the three Italian singers added together didn't equal her own age - 70, but as they say, who's counting? And really, that was the take-away from Monday's show: How could anyone count when the singular instrument that is Streisand's voice remains so powerful? It is deeper in places and the highest notes can be a little on the thin side here and there. But overall, the voice is not only strong and clear, but at least as expressive as it always was and perhaps even more so, in a way, because -- coral vs. orange notwithstanding - she let her hair down Monday night more than she has in previous tours. She actually seemed to be having fun performing live. Barbra sounded incredible tonight, truly in great voice better than Brooklyn and Vegas and with great energy while looking her best ever. In act 2 she came out in the black version of the coral dress but looked a little uncomfortable and said it was the new heels that she was wearing; they were black and pretty skinny and tall heel. When she came back after the Chris Botti solos she was in coral with same platform sandals she has worn. They played I Remember Barbra clip ( which didnt happen in Vegas) and then a little transition into the Funny Girl movie clip before My Man. Gypsy was on Fire! Always my favorite part and can't contain the massive glee I get, it could light the stadium. Rozzie and Barbra were so cute together holding hands before they started and singing holding them for the first part. Audience was great clapping and cheering her on and they liked the political stuff, Vegas had lots of clear boos but love tonight. Before starting Happy Days they stopped the music and played a clip of Diana Kind singing soprano and they said now she got her chance to perform. Of all the things that blew my partner away during Barbra Streisand’s superb performance last night at the HP Pavilion was her matter-of-fact assertion that she has only performed about ninety times in the past fifty years. Stage fright and her burgeoning film career may have a lot to do with the scarcity of her live performances, but I knew when I purchased our tickets that this would be a rare evening of freshly minted memories that would enhance the ones I already cherish from her 2006 concert. I have to admit I was concerned how a woman of 70 could possibly sound improved in those six intervening years. Concern aborted. She was in magnificent voice from start to finish and reminded me just how untouched her vocal mastery is. Yes, she was that good. One of the smarter improvements from the 2006 show was the installation of three giant video screens that made squinting less of an issue. They were put to good use at the outset with historic photos and video clips of her childhood in Brooklyn transitioning to her first professional experiences on the nightclub circuit, all of it accompanied by “You’ll Never Know” sung by a pre-adolescent Streisand seguing to a grown-up rendition that was recorded for her 1991 retrospective, “Just for the Record”. She arrived onstage in black sequins singing a crystalline version of “On a Clear Day (You Can See Forever)” followed by a jaunty medley of “That Face” and “Nice n’ Easy” from her recent tribute album to Alan and Marilyn Bergman. It was lovely to see her perform “Didn’t We?”, the Jimmy Webb-penned chestnut that was stuck in her vault before she finally set it free on “Release Me” this year. A sonorous take on Rodgers & Hart’s “Bewitched, Bothered & Bewildered” followed. Then the inevitable Il Volo segment came, very similar to the Il Divo segment from the 2006 show down to the manufactured patter. Although it’s always a pleasure to hear Streisand sing Charlie Chaplin’s “Smile”, the two numbers the teenaged Italian popera trio sang on their own were pure bombast to my ears. This was followed by her Q&A section, which felt a little sped up to me even though she delivered the requisite laughs. The contrived request to perform “Stoney End” was just a repeat of what she did in 2006, a brief snippet that really begs for a full version or maybe some other pop-rock number from that period. For instance, I would have loved to see her strut her funky self on “Sweet Inspiration/Where You Lead” like she did for the McGovern benefit concert back in 1972. The first half of the show ended with two fine medleys. The first was a tribute to her friend, composer Marvin Hamlisch, who just passed away in August. She sang the original haunting movie version of “The Way We Were” (which I always loved more than the pop single version) followed by “Through the Eyes of Love” customized as a personal remembrance of Hamlisch. Then came a Jule Styne tribute which was really an excuse for her to preview how she plans to tackle Mama Rose in the upcoming big screen version of “Gypsy”. She really nailed the demented ferocity of “Rose’s Turn” and “Some People” with powerful passion, more than enough to make Patti Lupone blush. I am convinced she will be electrifying in the role. She finished off the Styne medley with her signature number from “Funny Girl”, a driving “Don’t Rain on My Parade”. At this point, I was plainly awestruck. 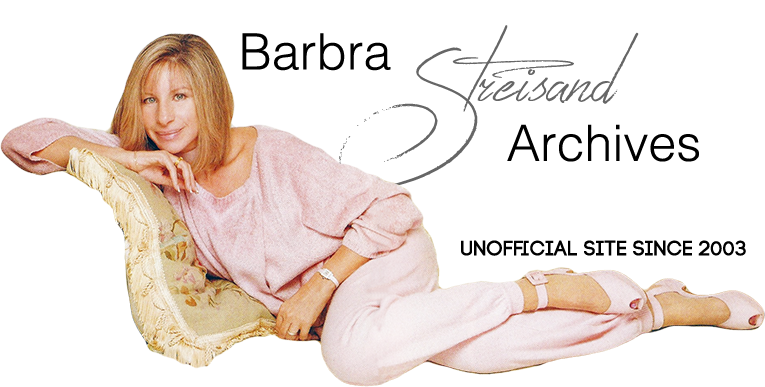 The break showcased a brief spot on the video screens about the Streisand Foundation and the work around addressing women’s heart disease, and then the video for Duck Sauce’s disco hit, “Barbra Streisand” showed up unexpectedly. As it turned out, the damnably catchy dance hit was completely lost on the older-skewing demographic of the audience. So almost was the short clip from Ken Burns’ seminal documentary, 1979’s “I Remember Barbra”, which opened the second half of the show. Funny clips for sure, but there wasn’t any context given about them. A more recognizable clip from “Funny Girl” transitioned nicely to Streisand’s reappearance in a flowing coral gown singing “My Man” beautifully. This led to quite a lengthy Chris Botti segment highlighted by a stunning medley of “What’ll I Do?” and “My Funny Valentine” and two selections from “A Star Is Born” including the inevitable “Evergreen” revitalized by Botti’s jazzy trumpet accompaniment. Botti had a nice solo segment, far more satisfying than the Il Volo segment, and he was accompanied in the second number by violinist Caroline Campbell. Very pretty and soothing. Streisand for another guest star segment, this time spotlighting her son Jason first through a birthday montage short he put together for her as he sang over it. Their duet of “How Deep Is the Ocean?” was sweet and plaintive, but I have to say his solo on “This Masquerade” felt a little charitable to me given his highly influenced voice sounded like it came mostly from his throat and not his chest. The last section of the show was lovely – “People” and “Here’s to Life” culminating into a powerfully anthem-like version of Leonard Bernstein’s “Make Our Garden Grow” backed by all her guest stars and a local choir. The duet with her half-sister Roslyn Kind, a replay of the Judy Garland “Happy” medley that has become a YouTube staple, came across as a bit stiff to me, but Streisand ended with smoky assurance on a most appropriate note with “Some Other Time”. Pure buttah is what it was and what she continues to be.